MASJID TANAH, MALACCA, 13 Apr 2014 – The banks of the Sungai Rembau-Linggi near Kampung Paya Lebar here have been selected by The National University of Malaysia (UKM) to plant the Berembang tree as part of its programme to breed and conserve fireflies. Deputy Vice-Chancellor (Academic and International Affairs) Prof Ir Dr Riza Atiq Abdullah OK Rahmat said the programme to preserve the fireflies in Kampung Paya Lebar is part of UKM’s firefly conservation in Peninsular Malaysia which includes Kampung Dew, Perak and Kampung Kuantan, Kuala Selangor . Prof Riza Atiq said the university has set up a firefly task-force based at the Bangi campus to ensure success of the project. Teams of those involved in the conservation efforts would be despatched to Kampung Paya Lebar to help those interested in planting the Berembang trees along the highly eroded river banks. The project was launched by the Malacca Housing, Local Government and Environment Exco Datuk Ar. Ismail Othman. UKM’s Nobel Laureate-in-Residence Dr Sir Richard Roberts from Britain and the project leader Assoc Prof Norela Sulaiman from the School of Environmental Sciences and Natural Resources were in attendance. Dean of the Faculty of Science and Technology (FST), Prof Dr Shahrim Ahmad, Prof Dato’ Dr Rahmah Mohamed also from FST and state tourism officials and village leaders attended the ceremony. Dr Norela told UKM News Portal that the firefly conservation project depends a lot on community participation especially people in Kampung Paya Lebar along with expertise from three faculties; The School of Environmental Sciences and Natural Resources of FST, Centre for Social Development and Environment of the Faculty of Social Sciences and Humanities (FSSK) and the Faculty of Economics and Management (FEP). The Kampung Dew fireflies are always perched on the ‘berembang’ (sonneratia caseoraris) tree which is indigenous to the mangrove swamps of the tropics. 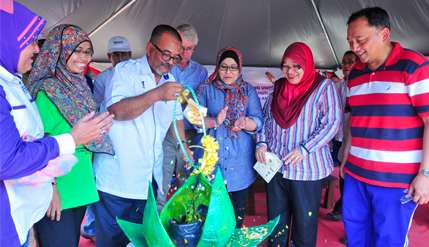 About a hundred berembang trees had already been planted earlier as part of the programme. Firefly conservation is important as the firefly is part of the many providers of ecological services in the wetlands. The firefly larvae are predators and keep a check and balance on natural pests especially tiny snails. Firefly (lampyridae) is a family of insects in the beetle order coleoptera. They are winged beetles and are commonly called fireflies for their conspicuous use of bioluminescence in their abdomens to attract mates or prey. Only the males can fly, while the females wait on the ground. Fireflies produce a “cold light”, with no infrared or ultraviolet frequencies. This chemically produced light from the lower abdomen may be yellow, green, or pale-red. The firefly programme is conducted by UKM researchers with incentive grants from the university-community research to encourage researchers to innovate for the benefit of the local community. Villagers are encouraged to participate in the project by planting the berembang trees. An estimated 90% of the mangrove plants grown in the nursery laboratory at UKM had successfully been transplanted at the site. Kampung Paya Lebar mangrove swamp is also famous as a habitat for mangrove crabs and the shellfish popularly known as Lokan and Lala, which has become an additional source of income for the local fishermen. The shells are usually found in brackish and salt water and depends on the nipah and berembang trees as their habitat. Unlike other shellfish, they will come ashore when the tide is high.